Nursing Skill: Assisting patients to feed and drink My chosen skill is to assist the patients to feed and drink. I have chosen this skill because I believe that it is a very important task, research and my personal experience has showed me that it is common in the hospital setting for patients to need assistance at meal times. It is undeniable that patient malnutrition needs to be taken seriously and nurses should have the appropriate knowledge and training to understand all the issues surrounding assisting patients to eat. Furthermore, nutritional support needs to be discussed and arranged between members of the multidisciplinary team to identify the problems and to adapt to the circumstances of each patient. Holland et al (1993: 169) claims "Being fed by others can be quite threatening and demoralising" and to support the patient the nurses need to understand and apply the Holistic approach to health in taking into account the individual physical, emotional, social and spiritual well-being. 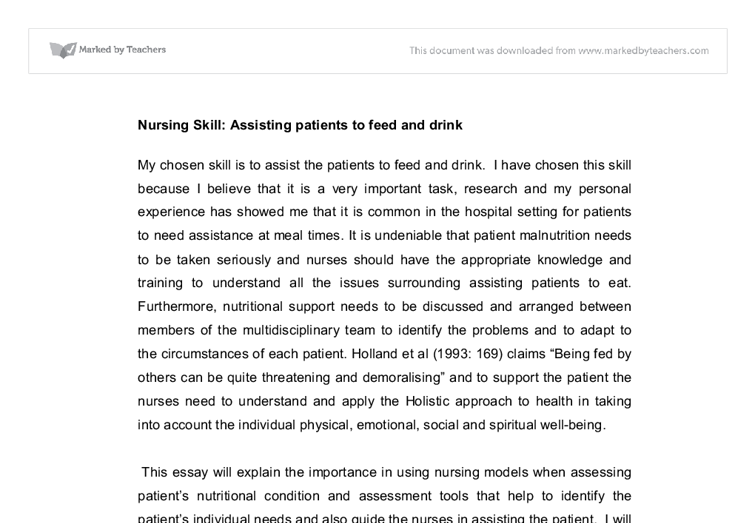 This essay will explain the importance in using nursing models when assessing patient's nutritional condition and assessment tools that help to identify the patient's individual needs and also guide the nurses in assisting the patient. I will also explore the importance of communication skills when assisting patients to feed. As good communication skills are so imperative when assisting patients to eat I will explore patient's personal limitations, environmental and cultural issues giving some solutions to overcome these barriers. 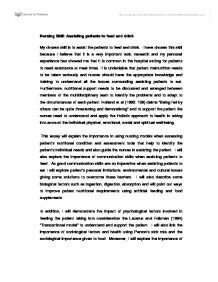 I will also describe some biological factors such as ingestion, digestion, absorption and will point out ways to improve patient nutritional requirements using artificial feeding and food supplements. In addition, I will demonstrate the impact of psychological factors involved in feeding the patient taking into consideration the Lazarus and Folkman (1984) "Transactional model" to understand and support the patient. I will also link the importance of sociological factors and health using Parson's sick role and the sociological importance given to food. ...read more. When assessing the patient, Body Mass Index (BMI) should be calculated and documented "The BMI calculation determines if you are healthy for your height" (The United Bristol Healthcare) and considers a healthy weight to be 18.5 - 25. To improve patient nutritional requirements "oral dietary supplements" can be recommended to "complement" the patient daily diet , moreover patients with dysphasia (swallowing problems) can benefit from the varieties of supplements such as "rice puddings" or "soups" that have the required texture (Green, 1999). Patients with swallowing difficulties require different food consistency, some patients need thicker foods and others maybe need liquidised foods. According to Holmes (2008) patients can decrease their food intake when they are admitted to hospital as they can perceive the ward environment as a stressful one. The way that patients perceive "food and drink" can be related to psychological issues as Holland et al (2003) points out. When assisting patients to feed it is important to observe and recognise any sign of stress or anxiety to be able to address the patient's real concerns. Lazarus and Folkman (1984) "Transactional model" focus on the interaction between the patient and the way the patient "appraise" their surroundings. In practice, this relates to previous life experiences and the way that patients had coped before. Manthorpe and Watson (2003:166) suggest "people who accept being fed instead of eating independently may develop a form of learned helplessness" that will delay their discharge. Therefore it is important to reduce insecurity and increase patient personal control and this can be achieved by enhancing patient self-education, giving emotional support and encouraging independency. Some reasons for cognitive impairment in hospitalized elderly patients can include dementia, delirium, trauma and stress. Patients suffering from dementia for example, are more susceptive to degenerate while in hospital because of their challenging behaviour to new settings and also distorted eating habits, loss of desire for food, loss of capacity to identify food, lost of capacity to use cutlery and swallowing problems (Amella and Lawrence, 2007). ...read more. The patient needs to be assessed to find their medical history and to focus on why the loss of weight for example, happened in the first place. I had also learned how important the use of a multidisciplinary team is to address the patient physical condition, for example if a patient has dysphasia a specialist in speech or a language therapist can give the best advice about sitting posture or head position that gives more comfort for the patient, the dietitian can ensure that nutritional requirements are met. I realize that to ensure correct nutritional support it is vital to ensure patients requirements such as, preferred foods and ethnic food choices are available. It is vital to check the patient's progress against the identified goals discussed beforehand by the multidisciplinary team to evaluate if they were met or not. I also learned that food handling should strictly follow policies respecting hygiene and should be given special attention because it is important for the patient's recovery. It is vital to ensure a clean environment, for example, a clean table, clean cutlery, to minimise smells or unpleasant noises. Staff should always wash their hands and encourage the same from the patients and their visitors. The nursing care plan should include a plan for discharge or transfer of care, for example patients returning to nursing homes, to assist a safe and successful discharge back into the community, it is necessary to ensure the same nutritional requirements continue to be met after discharge. It is important to have good communication skills to promote patient self-care through education and involving the patient's carer if necessary. It is also important to provide the carer's with appropriate knowledge to meet the patient's needs. To be able to write this assignment I had to do a lot of research. I used books from the library, the library database "OVID", the UBHT intranet in my placement and the internet to look for articles and journals. ...read more. More knowledgeable I returned to Betty, pulled a chair up beside her and in a calm and comforting manner I explained the reason she was in hospital, but Betty looked confused and asked me to speak into her right ear as she was deaf. Epstien and Borrell-Carrio, (2005), believed Engel excelled in his patient interactions, flexibility and observation. Engel believed all these qualities were needed within the medical profession not just diagnostic skills, holistic care should be taught, practiced and reinforced within the medical and nursing profession. George displays low self esteem and shows this by not taking control of diabetes, and although has had many appointments with the diabetic nurse to try and improve his symptoms, to improve his health he still is non compliant and does not appear to care. I then explained to my patient that I was going to flatten the bed to make it easier for us to roll him while we removed his clothes and washed him, I then raised the bed to my level to avoid any back injury while we carried out the task (Manual Handling Operations regulations 1992). As I scrolled through the pages only 4 articles stood out to me, I read through their abstract and decided to save these. 1. Article 4 ? Next-of-Kin?s, Perspectives in end of life care. (Boucher, J et al, 2010). 2. By sitting squarely towards Mary, keeping my posture open, leaning in towards her, maintaining eye contact and having a relaxed posture, encouraged her to relax and feel less intimidated and therefore talk more openly about her concerns. Although clearly upset by her experience she soon opened up and the verbal communication was made easier.